San Onfore Nuclear Waste Storage: Seeking the Best Option, First. 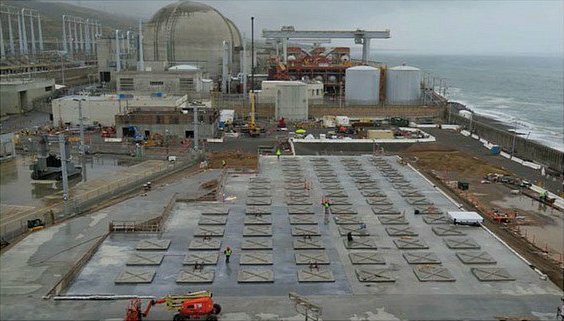 Triggered by the decommissioning of the nuclear power plant in 2013, the San Onofre Nuclear Generating Station (SONGS) near San Clemente, California, is now tasked with finding a safe and permanent storage location for 3.6 million pounds of extremely hot, and highly radioactive waste. The Surfrider Foundation is strongly opposed to permanent or long-term storage of radioactive waste at the deactivated San Onofre Nuclear Generating Station (SONGS) due to its proximity to the coastline, susceptibility to geological instability and location within a densely populated area. Surfrider recognizes the waste needs to be cooled onsite before it's moved and we demand that this is done as safely as possible, while also advocating the waste is moved as soon as possible to a permanent location away from the coast. Surfrider is calling for a federally-appointed storage site away from the beach, with consent-based siting, environmental review and a strict timeline from the federal government to quickly and safely move nuclear waste away from the dynamic coastline. Only if it becomes clear that permanent or interim storage is not a possibility, or there are concerns that onsite storage is no longer safe, alternative local sites such as the Mesa, will need to be considered. SONGS has been storing radioactive waste on site in cooling ponds since the early 1970s, which is the least safe method of storage because it requires active cooling. For instance, if the waste is not constantly cooled by circulating water, the spent fuel rods could get so hot that they cause an explosion. Additionally, cooling ponds were never intended or designed to provide long-term storage of waste. To eventually move the waste offsite, the hot, radioactive spent fuel must be cooled and “dry casked”. This requires removing the waste rods from cooling ponds and placing them into dry storage casks, where they have to be passively cooled for up to 12 additional years before safely transported. Between 2003 and 2014, one third of the waste was dry casked in 50 steel Areva canisters. Now, the remainder of the waste is being dry casked in 73 steel Holtec canisters. Both canister systems are placed into a concrete “monolith”, either horizontally (Areva) or vertically (Holtec), where they will stay until a final resting place or an alternative location gets approved. To date, 29 of the 73 canisters have been loaded, which means 60% of the total waste at SONGS has been moved to dry cask storage, with 40% of the waste still in cooling ponds, but expected to be fully dry casked by the end of 2019. Due to potentially inadequate safety training of Holtec contractors and Edison employees, and a near-drop of a canister during loading, the transfer of waste from ponds to dry storage is temporarily on hold until the NRC finishes an inspection. 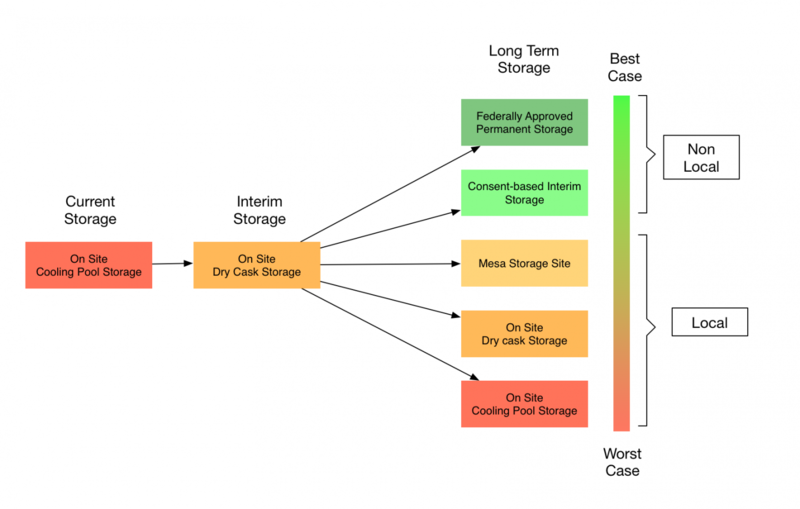 Figure 1: Illustrates the steps and the options for temporary and long-term storage. The Surfrider Foundation has ranked these options best to worst. Three options result in local storage and two options result in non-local storage. As illustrated here, Surfrider believes that these can be ranked from the best option (Federally-approved permanent storage) to the worst option, leaving the nuclear waste in cooling ponds. Three of these five options are local to San Clemente and the densely populated region of Southern California, and two options would move the waste away from coastal California. The five potential options are compared below. Federally-approved permanent storage would mean the nuclear waste would be moved to a site that was built specifically to store waste from nuclear plants around the nation, prioritizing the removal of waste from high risk, coastal plants such as SONGS. This method is considered the best and safest option for the long-term storage of high level radioactive waste. Advantages: This is the best option because the site would be designed and constructed for permanent storage of radioactive waste. It would be built away from densely populated areas, in a geologically stable and anhydrous underground environment, with thorough environmental and safety review. The site would be capable of taking waste from nuclear sites in need of storage from around the country. Yucca Mountain in Nevada was a site where this was being considered, but was tabled by the Obama administration due to political and safety concerns. Disadvantages: To date, no such site exists and there has been local opposition to proposed sites, such as Yucca Mountain. Locating and constructing a federally-approved permanent storage facility requires an act of Congress, funding, approval from the Nuclear Regulatory Commission (NRC) and will take an estimated 20 years to approve and construct. A federal repository will also require extensive transportation routes to move waste from across the country to a centralized location. Consent-based Interim Storage would mean the nuclear waste would be moved to a site, that is consented to by local and state agencies, tribes and the local community, that is designed to temporarily store the waste until a permanent facility is constructed. Potential sites exist in New Mexico and Texas. Advantages: The advantage of consent-based interim storage is that the facilities would be specifically designed to hold the waste for longer periods of time, from 40 to 100 years. Such sites are currently in development and are awaiting federal approvals. These sites tend to be in areas with lower population densities and away from hazards including coastal storms, saltwater, and earthquakes. Disadvantages: At present there is no meaningful consent-based siting process for storage of spent nuclear fuel, and there is local opposition to some proposed interim storage facilities. Temporary storage facilities could become de facto permanent storage if a permanent storage facility is not approved and constructed. Interim storage would also require the transportation of waste twice, once via rail to either Texas or New Mexico for the interim storage, and again once a permanent repository becomes availabe. Dry cask storage on the Mesa means storing the waste more inland on the Marine Corps Base of Camp Pendleton, east of the I-5 freeway. Parcels of this 135-acre property are currently leased by Southern California Edison (SCE), but SCE is in the process of returning these parcels to the Department of Navy. Advantages: The site is farther from the coast than the existing SONGS facility and is at a higher elevation, which reduces the threats from corrosive effects of salt water, sea level rise, coastal erosion and tsunami hazards. Several groups also believe that moving the waste deeper into Camp Pendleton will reduce the threat of attacks. Disadvantages: The “Mesa” site results in the waste being stored locally in a highly populated region of the country and faces risks from fire and earthquakes. It would require nuclear waste transport across the highway and railway. Further, the Mesa site has not been analyzed or approved by Congress, the NRC or the Camp Pendleton Marine Base. Thus far the Camp Pendleton Marine Base has made it clear that they do not approve of this location. The odds of approval of this site could be as challenging as a consent-based storage location. This is the process currently underway to store the waste on site at the SONGS facility until the waste is cool enough to be transported elsewhere. Advantages: Dry cask storage on site has the advantage of being passively cooled, in other words, the waste will not meltdown without being supplied a cooling agent, and is therefore safer than storage in the cooling ponds. This process has been approved by the NRC and is generally a necessary step for the eventual transport of waste to a permanent or consolidated repository. Disadvantages: Dry cask storage on site is not intended to be permanent or long-term, and the containers only have a 20-30 year lifetime before the waste needs to be stored in a different way or alternative container. The current site at SONGS is close to the ocean and is subjected to salt water spray that could increase corrosion risk. Further, the site could be exposed to sea level rise, elevated groundwater table, tsunamis and geologic hazards such as earthquakes. This is also local storage in a densely populated region, adjacent to heavily used recreational areas, coastlines and transportation corridors. Note: There has been controversy about the Holtec containers used and calls for alternative container technologies. It’s important to note that other container technologies have not been approved by the NRC nor are available. Such approval could delay the project and results in the waste staying in the cooling pools, which is the highest risk storage alternative. It’s also not clear whether the trade offs from other container technologies significantly reduce the over all risk of a hazard. The spent waste has been stored in on site cooling pools since the first waste was generated in the early 1970's. The cooling ponds require active cooling by circulating water around the extremely hot waste. Advantages: There are no advantages to keeping the waste in the cooling pools. That said, the cooling ponds have been used to store the waste essentially without incident since the early 1970’s, but these ponds were never designed or constructed to safely store waste for the long-term. Instead of being used to store the waste, cooling ponds may provide the ability to transfer waste from one canister to another in the event of a crack or loss of structural integrity. Disadvantages: Cooling ponds require active cooling, and need access to continual power and water, placing it at high risk if access to electricity or a generator gets interrupted. The water used for cooling is also discharged back into the marine environment, frequently containing trace amounts of radioactive particles. This system was also never designed to provide safe, long-term storage of nuclear waste, as it was only intended to cool the spent fuel before alternative storage. As mentioned, this site is in a densely populated region, subject to geologic and coastal hazards, and adjacent to heavily used recreational areas, coastlines and transportation corridors. Spent fuel waste has been stored at SONGS since the first waste was produced a couple years after the plant opened and began operation in 1968. This waste has been stored in cooling ponds for the last several decades with little incident. When SONGS and other nuclear power plants were first operationalized, there was a plan to build a permanent storage facility and start accepting spent fuel by 1998. However, the federal goverment failed to come up with a permanent site to put the nation's waste. For many years, a site known as Yucca Mountain was the recommended site but that site remains unpopular in Nevada and there are environmental concerns such as ground water connectivity to the Colorado river. To date there still is no federal storage facility. Like SONGS, over 35 other coastal nuclear generating stations are coming to the end of their life, creating a national need for permanent storage of spent nuclear waste. The Surfrider Foundation is closely monitoring the dry-cask transfer process, demanding stronger onsite safety measures both during and after the transfer process, and advocating for federal action to promote what Surfrider sees as the best and safest option for nuclear waste: a permanent storage facility away from the coastline, as soon as possible. Learn more about the campaign here, and take action now to tell your federal reps to get the waste off California’s coast!